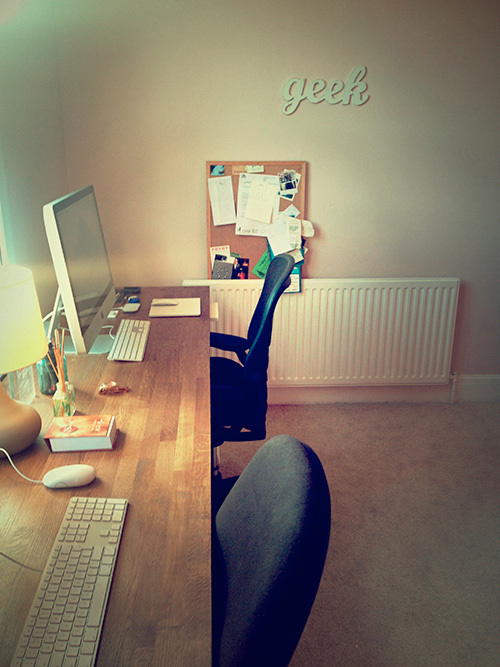 When I Instagrammed a picture of the office re-vamp I had loads of people asking via Twitter and Instagram where I got my desk from. I’ve never been one to hide my sources so here’s a little run down of what’s what. I had a Scumble Goosie desk but the paint bubbled and the surface of the wood itself cracked after just a year of heavy use, plus I needed a more robust solution that made it easier for Kathryn and I to work side by side – the workbench idea formed. They don’t make the exact legs anymore but they were from IKEA – similar here – £25 each. The table top is a piece of Oak cut to 3m and with a thicker depth than a kitchen worktop purchased here for £185. I then stained it with Ronseal Georgian Oak Wood Dye. Next Post Spec work & how to make my blood boil.